Starring Kristen Connolly, Chris Hemsworth, Anna Hutchison, Fran Kranz, Jesse Williams, Richard Jenkins, Bradley Whitford and Amy Acker. Let’s face facts right up front here. Cabin in the Woods was shot in 2009 and finished in 2010. Hearing this you may feel this is yet another movie dump like the Eddie Murphy vehicle from earlier this year, A Thousand Words, which like most movie dumps was terrible. This couldn’t be further from the truth. Cabin in the Woods was slated for a late 2010 release until MGM filed chapter 11 and pulled everything from their release slate. Through negotiations Lionsgate acquired the finished film for release and then tinkered with a 3D post conversion, against the strongly expressed wishes of writer/producers Whedon and Goddard. Thankfully we finally get to see this film, non-3D conversion, in theaters starting this weekend. What we get is a brilliantly conceived interpretation of the genre as a whole, a genius view of the contentions and as the Scream movies point out “The Rules” of the genre and how there may be more behind what we really are seeing than we previously may have thought. But before I go any farther, a warning: if you want to see this movie and have not yet, and you really should, STOP READING NOW. I know shocking right? Do not continue to read if you want to go in to the movie unspoiled, because even with me trying not to spoil, it will be spoiled. Go in knowing as little as possible and you will be very thankful you did. Then come back and read this and let me know what you think. YOU WERE WARNED! We open in a vaguely developed government facility with Sitterson (Jenkins) and Hadley (Whitford) discussing the upcoming mission in broad terms with Lin (Acker) and relating the failings of other outposts around the planet. We then are introduced to Dana (Connolly) and Jules (Hutchison), 2 college roommates who are gearing up for a trip to the titular Cabin under the assumption that Jules’ boyfriend Curt’s (Hemsworth) cousin has recently purchased it. Dana has recently broke off an affair with her professor, something Jules is determined to get her past by setting her up with Curt’s book smart / lacrosse playing friend Holden (Williams). Also along for the ride is the resident substance abusing sidekick Marty (Franz) and his amazing smoking utensil, a joke I will not give away here. We soon learn all things are not as they seem as the government officials have a very detailed amount of information at their disposal about all of these students and seem to be in control of each move they make. We start to realize there is much more at stake behind what is happening as the group ends up deciding their own fates, literally. There is also much more going on in the government facility and we find out just how connected to the events of the weekend they really are. Twists and turns abound as the film builds to a unpredictable climax with deadly implications. 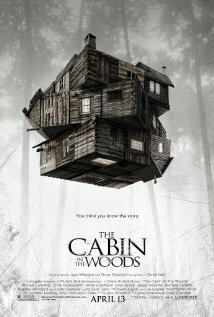 Cabin in the Woods is blessed with a brilliant script and vision that Goddard and Whedon have fought tooth and nail to protect. And the audience is the benefactors of their passion. An amazingly original take on a whole genre that feels fresh and new, while paying homage and borrowing from the past, Cabin succeeds where so many others have failed. The cast works well together, Whitford and Jenkins are brilliant in their government bunker overseeing the activities with Acker trying to be a voice of reason in the background. Hemsworth and Williams both show why they have achieved their levels of success outside of Cabin. Connolly and former Power Ranger Hutchison, in a role extremely far removed from her children’s show beginnings, work well as the female leads. Franz brings the caustic wit he brought to his character in Whedon’s Dollhouse to the role of Marty, who like Acker, is one of a few of Whedon’s regulars peppered throughout the film. The way Whedon and Goddard play with the stereotypes and conventions of traditional slasher fare and the manipulation of such with respect to the story is such a brilliant concept it begs the questions as to why it took so long for someone to think this up. I’m just glad that Whedon and Goddard have finally figured a way to play with these traditional slasher roles in a whole new way and present a daring and original vision along the way. Easily the best film I’ve seen this year and I’ll be surprised if it’s not in my top 10/15 films by the end of the year. Get out there and see this, then come back and tell me what you think.